This committee is responsible for programming social and educational opportunities for students to interact with culinary arts. Food has the power to bring people together. The Culinary Committee offers ways for students to eat, connect, prepare, and more. Some responsibilities for the committee could include: Grocery Bingo, food preparation workshops, partnerships with KU Dining and residences, Tea @ 3, Murder Mystery Dinner, and other fun ways to experience food. 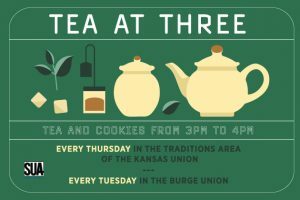 Join us in the Kansas Memorial Union every Thursday at 3pm and the Burge Union every Tuesday at 3pm for free tea and cookies!